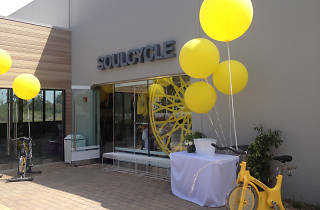 Head to this cult-favorite cycling studio for a high-energy spin class, just steps from the sparkling Pacific in the Malibu Country Mart. Riders sign up for 45 or 60 minutes of motivation and sweat, complemented by dim lighting and inspirational coaching, for an intense full-body workout within a mind-clearing atmosphere. With classes built to suit both beginners and cycling veterans, the instructors at SoulCycle make it a goal to leave no one out of their "cardio sanctuary." Single classes start at just $30, giving you no reason not to do your glutes this much-needed favor. What's more? The beachy Malibu location is bound to be frequented by celeb locals so keep an eye out for A-listers getting their sweat on in the back row.